The United States may carry strikes against Syria in fear that its allies' strategic defeat by the Syrian army may persuade other countries in the region to join the newly emerged winning alliance of guarantor states - Russia, Turkey and Iran, experts told Sputnik. On Saturday, several media outlets, citing Syrian militants, accused the Syrian government of carrying out a chemical weapons attack in Douma, located some 10 kilometers (6.2 miles) northeast of the capital Damascus. Trump blamed Syrian President Bashar Assad for the incident, adding that Russia and Iran were also responsible because they support the Syrian government. On Monday, Trump said his administration would make a major decision within the next 24 to 48 hours on what the US response will be. 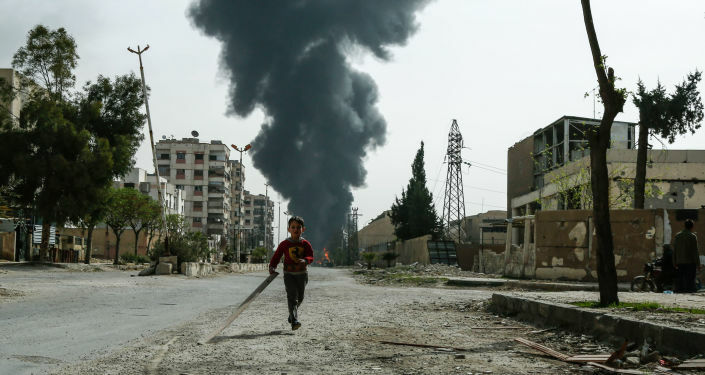 The Russian reconciliation center for Syria on Sunday categorically refuted the media reports that the Syrian military dropped a chlorine-filled bomb on Duma. The Russian Foreign Ministry said such erroneous information aims to cover the actions of terrorists and justify possible external military intervention in Syria. "The Americans and its allies like the Saudis and Israelis have suffered a major strategic defeat of incalculable proportions in Syria. They have failed to achieve their goal, leaving Assad in power and Syria (and its Hezbollah ally) to serve as examples in the Arab world that resistance to the West is possible," Alessandro Bruno, an analyst at Toronto-based advisory firm Lombardi Letter and former UN officer in North Africa, told Sputnik. At the April 4 summit in Ankara, leaders of Russia, Turkey and Iran, Vladimir Putin, Recep Tayyip Erdogan and Hassan Rouhani, "pulled off a major coup," he noted. "They managed to pull Turkey away from NATO and into the Russian/Iranian camp on a key issue," Bruno stressed. He recalled that Erdogan was one of the first to challenge Assad at the start of the Syrian civil war in 2011. "It’s a bit like a mob war now. If the United States doesn't give Russia 'a bloody nose' over this, it will look weak in the Middle East. It may even persuade some of the Gulf States to shift allegiances more in favor of Moscow and Tehran than Washington and Riyadh. One key Gulf State, Qatar, appears to have already done this," he concluded. Head of the Riyadh-based Center for Media and Arab-Russian Studies, Majed bin Abdulaziz Al Turki told Sputnik he believed the United Stetes and its allies would most likely conduct strikes against Syria. "It is expected that the Western countries will strike. This happened yesterday and was attributed to the Israeli army," Al Turki, told Sputnik. The issue appears to be a competition of international powers for their interests at the expense of the interests of the countries of the Middle East, he added. "It’s highly likely – if not certain – that the alleged chemical attack with chlorine (last year it was sarin) that, in the total absence of evidence, NATO (led by the US, the UK, France) is being used to justify and compel the US to intervene against the government of Bashar Assad," Bruno said. The effort is to complete the step that Barack Obama did not take in 2013, he noted. "Obama looked for all possible ways to avoid becoming embroiled in Syria in 2013. He was eventually 'forced to act' by proxy forces on the ground. 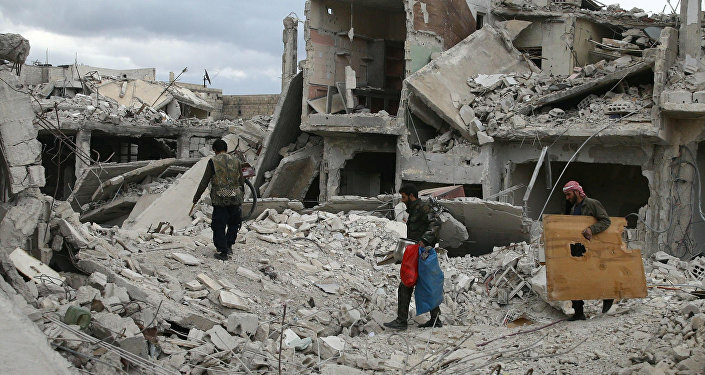 Now, we have to wonder what more trouble can millions of Syrians expect, after having endured over seven years of war (and not a civil war, but a full-fledged international conflict)," the expert explained. The attack on Syria no longer represents a red line to Washington, and this goes against US President Donald Trump's statements during the tenure of his predecessor Barack Obama, he recalled. "A direct US strike against Damascus – presumably against government targets, something that remained a 'forbidden' fruit until April 8 – now seems inevitable, unless Trump remembers what he tweeted on August 29, 2013: 'What will we get for bombing Syria besides more debt and a possible long term conflict? Obama needs Congressional approval.' But, given that Trump has already shown he has forgotten that tweet when he attacked a Syrian air base on April 7, 2017, the chance of his memory being refreshed now is even slimmer," Bruno said. THe United States will most likely ignore the fact that their military intervention overseas lacks approval of the UN Security Council, as it has done in the past, Bruno said. "Given precedents, (Iraq, Libya, etc.) the United States will have no hesitation of striking Syria without UNSC approval," he said. The Syrian War is not a 'civil war,' but a proxy conflict between major powers, the expert noted. "It’s not just about Asad, ISIS[Daesh], the various Jaysh al-Islam and others. It’s even more about Turkey, the US, the Arab monarchies, Saudi Arabia, Israel and Russia," he said. If the United States conducts a military operation against the Syrian government, the United Nations will most likely ignore it, he said. I don’t expect any other reaction from the UN, in case of a US strike, other than the same old supine apathy. The UN has a chance to speak out now, urging for a verification of the facts in light of what Russian and Syrian inspectors are saying about the nature of the latest chemical attack: that it’s false. But, it does not matter. The West, led by the US, is looking for excuses to prevent Assad from completing his victory and rebuilding Syria. The UN can scream until all representatives are blue in the face, it won’t matter," Bruno said. The decision to topple Assad was made years ago, and Washington seems to stubbornly push for it by any means, he concluded.